The Life and Times of the Old Testament. All the stories of the Old Testament in one set: Creation, Adam and Eve, Noah, Moses, Samson and Delilah, David and Goliath, Jonah and the whale and many more. 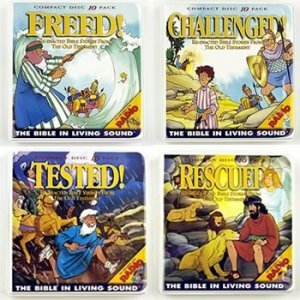 Listen to the dramatized Bible stories in these four volumes beginning with Creation to Queen Esther. Listen as the animals are FREED! from the confines of Noah's ark! Hear giant Goliath's angry mocks as the boy David is CHALLENGED! to trust in God! Detect the true mother of the baby brought to a wisdom-TESTED King Solomon! Listen with awe to Daniel's earnest prayer before he is RESCUED from the lion's den! Walk with Queen Esther as she approaches the king. THE BIBLE IN LIVING SOUND's audio dramatizations are reenacted events in the Bible that captivate listeners of all ages as they visualize and learn the values taught in God's Word. Listen to the Bible ... in living sound! Listen to the dramatized Bible stories from Creation through Queen Esther in FREED!, CHALLENGED!, TESTED! and RESCUED! Use Exploring God's Book 1 and Exploring God's Book 2 workbooks as a Bible study guide for personal study, church, Sunday School and home school curriculum for Volumes 1 to 4.